The custom handmade wedding guestbook above was made for a wildflower themed wedding. 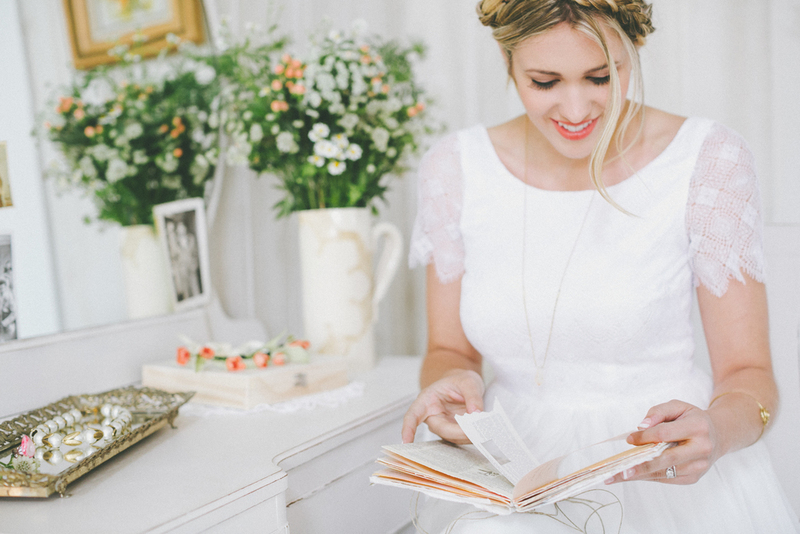 It features floral embedded paper, watercolor pages, vintage flower illustrations, a variety of dictionary pages, and lined spaces for guests to leave a message to the happy couple. This one-of-a-kind book was photographed by Alissa Saylor, styled by Stockroom Vintage, and published in the July 2014 issue of Smitten Magazine. If you're interested in having a handmade wedding guestbook created for your special day, please read the FAQ below. Will you make my wedding guestbook? I would be honored to! Wedding guestbooks are available on a case by case basis via custom order. All of my books are made with meticulous attention to detail and are frequently described as unique, charming, romantic, and whimsical. I focus on creating high quality, long lasting, heirloom pieces. If you are familiar with the aesthetic of my work and you like what you see, then we will probably be a great match. I recommend contacting me about 6-10+ weeks before your wedding date. Sooner is always better than later, as I often have a queue of projects planned a few months in advance. This time frame allows for us to discuss details and for me to source, order, or make any special materials required. Each of my handmade books begins with a client questionnaire. I will assess and evaluate the goals of the project, then send a detailed project description and price quote with a deadline. From there, I create the ideal guestbook for your wedding, photograph it to share in my portfolio, and ship it to you. I maintain frequent contact and provide progress photos to each of my clients which ensures a smooth experience for both of us. How do I know you'll make something I'll like? Because you've already read this far! People come to me for one-of-a-kind handmade books because they like what they've seen me make in the past. All of my books are created to fit each client's unique goals. Based on our initial conversations and my client questionnaire, I use a time tested process to create the perfect wedding guestbook. I am very open and methodical throughout the planning phase so that you know what to expect every step of the way. All of the books you see on this site were successfully created using the methods I've outlined above. If you like what you see here, then you're going to love a book that's created specifically with you and your big day in mind! To get started, just shoot me an email on the contact page.